Welcome to the Arizona Tennis Association lesson program. Founded in 1988 the A.T.A. has instructed over 100,000 students. A.T.A. students have developed from beginners to state high school champions. Many A.T.A. students compete on high school teams and have gone on to play college tennis. 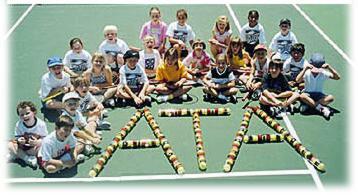 This program offers the best way to learn tennis in a positive, fun and rewarding environment. A.T.A. instructors are experts at teaching beginners and instilling lifelong tennis skills. The A.T.A. tennis lessons are offered in 8 week sessions. One hour per week, for 8 weeks, in a row. $160 for (8) weeks, at many Phoenix area schools, parks, and JW Marriott Resort. Classes are taught in a group, with an 8:1 student to teacher ratio, many Instructors have an Assistant to help them on the court. Parents are welcome to watch, and pick up balls, too! Classes provided by age groups, 5 to 8 year olds, Ages 9 & up Beginners, and Advanced Beginners for teens. Students can be graduated UP a level when specific tennis skills are accomplished. A different stroke is introduced each week and is reviewed in the following classes. Missed lessons can be made up within the same session at another location and time. Please try to attend a make up lesson within the same week to maintain continuity in your learning process. To schedule a make-up class, send an e-mail to the office, or call the A.T.A. Office at 480-970-0599. September 15, 2018 - May 30, 2019. Those students ready to progress beyond the Advanced Beginner level, and are interested in competing on their high school tennis teams may be assessed, and will be invited to enroll in the ATA ACADEMY. Junior Varsity, and Varsity level classes are offered twice a week, for 1.5 hours each day, on Tuesday's and Thursday's at the JW Marriott at Desert Ridge Resort. Call the A.T.A. Office to schedule an assessment PRIOR to enrolling to ATA ACADEMY level classes. Jr Varisty and Varsity level classes are priced at $300 per month, and space is limited. Those who play tennis know that tennis provides more than just exercise. The sport of tennis requires character traits such as self reliance, discipline, and the ability to problem solve. Sign UP now to learn the life long game of tennis! Tennis racquets are available to purchase for $30 from the teaching professional at each location. The Pro will personally fit your racquet to you at your first class. A.T.A. tennis classes are offered for beginners, advanced beginners, and intermediate level players.